If you've ever been a nurse, you'll already know just why specialist nursing shoes are so important. Nurses spend a huge amount of time on their feet, doing ward rounds, attending to patients and carrying out the numerous other duties the profession demands. High heels or shoes without the appropriate levels of support just wouldn't last more than an hour or so, making nursing shoes an essential purchase. In addition to standing and walking for long periods of time, and sometimes carrying or pushing heavy medical equipment while doing so, nurses also have to move around quietly, to avoid waking their charges. Again, heels which clatter and click won't go down well on a quiet nursing ward, so shoes for nurses need soft soles as well as lots of support. Although nurses are primarily interested in comfort and practicality when choosing shoes for work, there are a few different styles of nursing shoe to choose from. The style you choose will largely depend on your personal preference, but do check with your employer to see if there's a particular style or brand they prefer their employees to wear. If you've visited a hospital recently you may have wondered why so many nurses and auxiliary staff seem to be wearing clogs. After all, they don't seem like the most obvious choice of footwear for people who are on their feet all day, do they? Of course, the clogs worn by nurses aren't the traditional wooden-soled clogs we're used to choosing as fashion items. 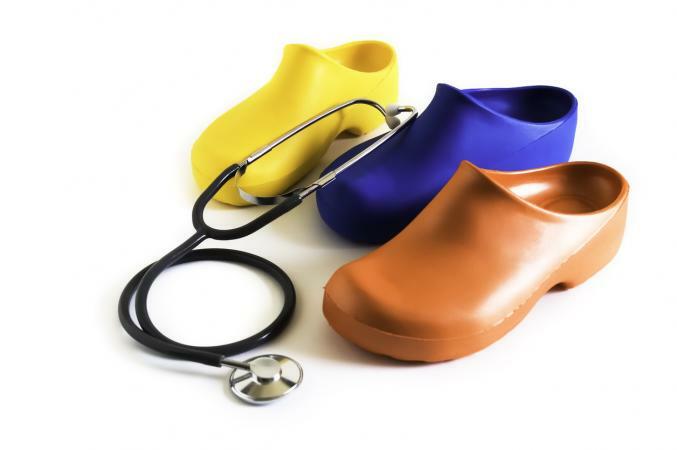 Nursing clogs are made from thick plastic or rubber, with soft soles which are ideal for padding up and down the ward without disturbing sleeping patients. They're also surprisingly comfortable, being designed to offer maximum support to the foot. An increasingly popular style, these shoes look more like running shoes than work wear. In fact, some nurses may actually choose traditional athletic or walking shoes rather than specialist footwear for nursing. Again, these shoes are easy to wear all day. They have flat heels and rubber soles which offer excellent grip, and they're designed to be kind to your feet. Within these two broad categories you'll find a multitude of different styles, with most shoes coming in basic white. Some nurses, however, are now seen sporting black shoes, or other colors. Have your feet measured each year. Don't just assume that your feet will be the same size year after year. Our bodies change as we get older, and people who spend a lot of time walking are more likely to see changes in foot shape and size. If you're unsure whether to buy running style shoes or clogs, the only way to decide is to try both. Although your colleagues' recommendations will be useful when it comes to choosing a brand, we're all different, and what works for one person may not work for another. Use insoles or arch supports if appropriate. Even once you've found the right shoes, you may be surprised to find your feet still aching at the end of a long shift. The way you walk, plus the type of feet you have, may mean that particular strain is being placed on one part of your foot. Visit a podiatrist to identify whether you need special supports or insoles inside your nursing shoes. Support socks and hosiery designed to help improve your circulation and prevent foot and leg problems can be a worthwhile addition to your working wardrobe.